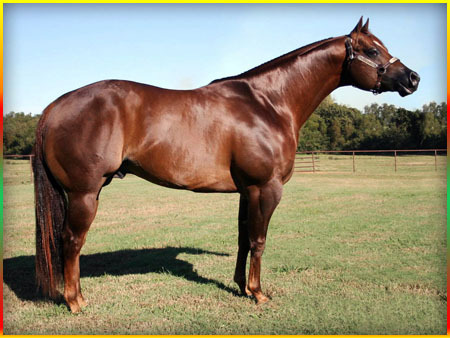 For some strange reason I was under the impression that QH Halter horses had moved away from the muscle bound, post-legged creature when HYPP was confirmed to follow these horses’ bloodlines; that breeders immediately tested all their stock and culled (or at least stopped breeding) those positive for the genetic marker. I was wrong. Thank you to Steph C for making me ill. In fact, I want to know why the AQHA would even allow a HYPP N/H individual (stallion or mare) to be eligible for what is essentially a ‘breed’ title, when they clearly recognize it as an undesirable genetic defect. After all, are halter horses not supposed to be the epitome of the breed, displaying true and pure breed characteristics derived from solid genetics? That led me to go looking for a picture of Impressive to see if her statement was true. Here is a picture of Impressive later in life. On the weaker side of things, his ribcage didn’t carry back particularly well and his loin was longish. His shoulder angle is a bit closed, he’s tied-in below the knees, and he doesn’t carry enough bone for his size. While he’s straighter behind, he’s not post-legged. At first I thought he was bull-necked, but looking at the odd and over-developed muscling behind his ears and throat, the lack of crest muscling and the line of muscling directly in front of the shoulder indicates that he hurt his neck at some point, such that the bull-neck posture is likely pathological. The over-development of croup muscling is also likely from injury, particularly when we also consider the flat and angular loin. 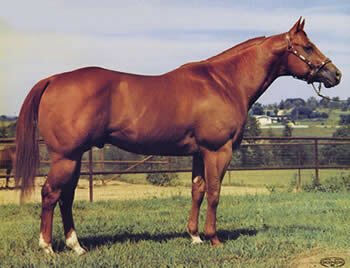 And yes, he’s got quite a lot of muscle mass, which was one of the main reasons he was used for halter horse breeding. It isn’t, however, grossly over-exaggerated like we see now in halter horses. Let’s take a closer look at one of this breeder’s champion stallions to compare conformation that is winning in the ring today. On the positive side, this stallion and the rest of the breeding stock (mostly) possess quite nicely structured and set necks of appropriate length. Most have maintained medium backs; all have big hips and well placed LS joints, and loins of depth and breadth. We also see the croup muscling coming forward and being full over the loin and into the back, that’s quite good. While Impressive had a bit of a laidback shoulder, this stallion’s is quite laidback. The shoulder angle, though, is a bit closed. Like this stallion, most of the horses possess a steeper pelvis than Impressive, but body balance is similar being slightly downhill. This horse’s face is really too short. The real big issues for these halter horses are the lightness of bone and the excessive post-leggedness. The latter in this case causes the horse’s hamstrings and associated soft tissue to be attached too high and be too tight. This (excessive post-leggedness) should be a deal breaker, all day long, every day, for ANY horse regardless of discipline, and when you combine that trait with joints that are too small and a massive body above you’re, at the very least, out of your mind to perpetuate it as a breeder.